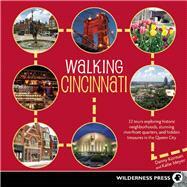 Walking Cincinnati by Danny Korman and Katie Meyer is the first book in decades for local history fanatics and adventurers wanting a more hands-on approach to Cincinnati history and culture. This guide literally walks readers through the city's renowned historical, architectural, and culinary sites. The unique character comes alive through Walking Cincinnati's focus on human-interest, and gives the readers surprise after surprise in its 30 walks. Never before has such an extensive book been written that highlights not only the architecture, art, and food, but also touches upon Greater Cincinnati’s darker side. Tales and locations of crimes, hauntings, illegal casinos, mob bosses, and brothels will astonish readers and unveil secrets of the city that have long been overlooked by traditional local history books.